The biggest Wonderland restaurant has just opened on the world's largest cruise ship. The experience at the two-storey topsy-turvy restaurant begins upstairs. Walking through a cave-like entrance you will find an intricate golden door standing on its own for no reason other than whimsy. That gives you a sense of the meal you are about to enjoy. Beyond to the right is a bar serving inventive cocktails alongside the usual selection of drinks. Ahead there are a couple of tables and an awful lot of vacant floor space. The view from the duplex balcony gives a glimpse into the magical world that lurks beneath. A spiral staircase leads downwards. An assortment of tables makes this venue ideal for couples seeking a romantic meal for two, or groups of friends who want to share an original experience. Two families were dining in the restaurant when we (me and my wife) visited, although we had opted to check our son into the Royal Tots club for the under threes. Moreorless a group babysitting service, this was priced at $8 (&thickapprox; £7) per hour and we needed two and half hours of care. We were given a telephone in case they needed to get hold of us, which intermittently lost signal, reminding us just how big this floating city was. The sleek teal and white colour scheme lacks the 'magical' distinction of the smaller venues on Quantum of the Seas and Anthem of the Seas. Yes, the duplex design adds vertical space, and the views through the double-height glazing along the Boardwalk to the AquaTheater and the aft beyond are enviable. But this comes at the cost of an intimate, cosy, unique and quirky setting. While the interior design may lack an edgy quality, the waiters and chefs more than compensate for this. Our 'mad hatter' for the night in Wonderland was 'Marlon Brando', a waiter dressed in an aubergine-coloured velveteen long-tailed coat. Juggling several busy tables he relished his part in our dinner production show. He brandished two easels, paintbrushes and a small pot of water. A trademark aspect of Wonderland, the text on the 'magic' menus only appears when you brush water over the paper. Five core elements differentiate the dishes - sun, ice, fire, sea, and earth. Bewildered by all the enticing creative dishes, Marlon soon arrived to explain how Wonderland worked. Fussy eaters could choose their most favourite dishes as in a 'normal' restaurant. But for a real taste sensation, you are advised to put your faith in your waiters to craft you a memorable bespoke experience. While the diners to the side of us opted for the former, we jumped feet first into the experience by opting for the latter. A five-course meal then followed (you certainly will not leave hungry!). Our meal began with a trio of tasters. 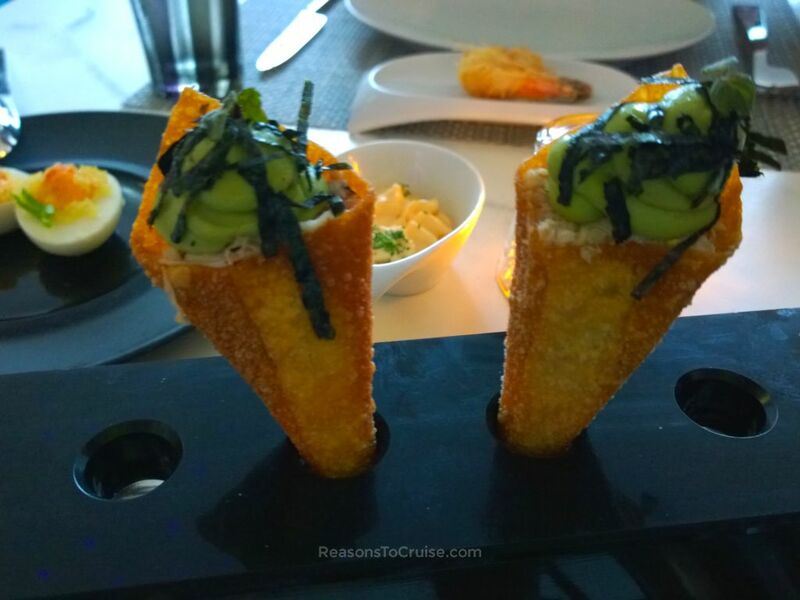 Crispy Crab Cones topped with coriander, ohba leaf, and avocado mousse (Ice) led the course. Shrimp wrapped in Kataifi sat aside a scotch bonnet mousse (Fire). Buffalo Chicken Eggs with Blue Cheese and Hot Sauce arrived, covered with a smoke-filled glass cloche (Fire). With two options from the Fire menu, this course was certainly about spice. The shrimp was delicious although brace yourself for the powerful kick of the fiery mousse. I am not a huge crab fan, but the cones made me question why not? The avocado mousse was strong in flavour but had a clean taste. The smoked eggs were delicious. Based on our feedback, Marlon created the second course. We had left the world of spice behind and now headed deeper into culinary ingenuity. This trio commenced with a spoon of Liquid Lobster served with bone marrow and caviar (Sea). A reconstructed Caprese Salad (Sun) came with liquid olive, ricotta powder and basil. Sashimi of red and white tuna with charred spring onions (Ice) concluded this course. This course was where the whimsy Wonderland is known for really began to shine through. The spoonful of silken liquid lobster was sublime, with a delicate yet decadent feel. 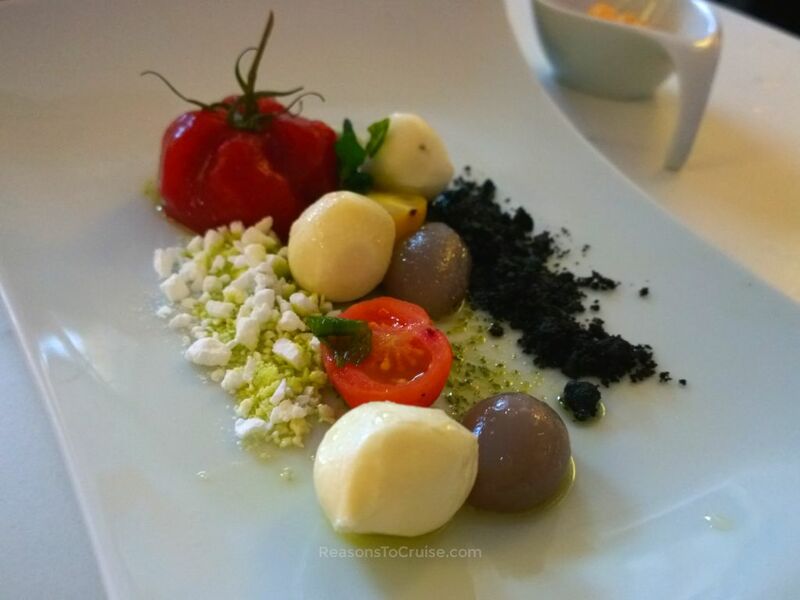 The Caprese Salad was a culinary marvel where a seemingly simple looking dish disguised complex flavours and unusual textures. My favourite from the trio was the sashimi plate with its vibrantly clean flavours. 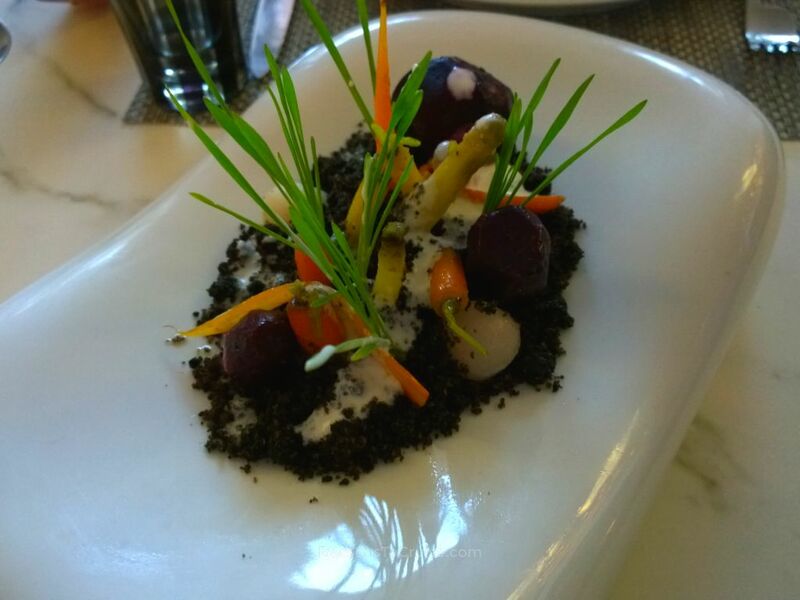 The foodie madness continued with Wonderland's signature sharing dish - baby vegetables in the garden with edible soil and pebbles (Sun). One of the most beautifully presented dishes, this epitomised the quirky and unexpected style of food Wonderland specialised in. Sadly, it was a Marmite-style of a meal. While I loved the beetroot and carrots, the dense pumpernickel-based soil was far too salty for me to enjoy. I wanted to like it, but I could not. Marlon reassured me that the dish divides many passengers. Some love it, and others do not. But that in itself is the beauty of Wonderland. It is about stepping out of comfort zones to try new flavours, textures, and tastes. It is about forgetting the ordinary and experiencing the next level, however, creative that may be. Sensing he had perhaps pushed us too far with the whimsy, Marlon was keen to get us back on track. He next opted for a pair of dishes that showcased sheer excellence. Terroir beef came with river stone potatoes and a bordelaise sauce (Earth). Branzino (European seabass) sat beneath crispy bread and atop of a tamarind spice emulsion (Sea). The word 'exquisite' does not do the beef dish any justice. I could clearly understand why Royal Genie Reyno recommended the beef over a steak at Chops Grille. The melt-in-the-mouth meat was so tender yet full of flavour. Had this been the only dish I sampled, I would have left a euphoric customer. 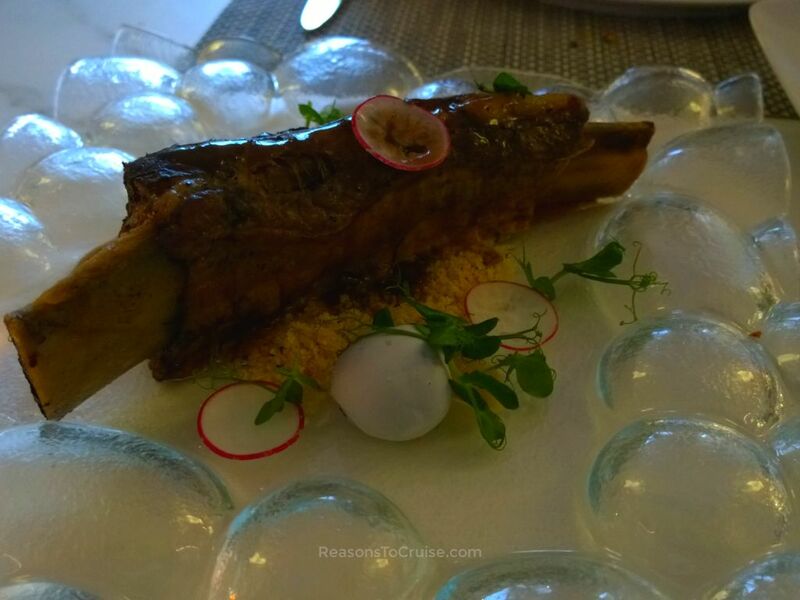 If you are an avid Chops Grille fan, make sure you book into Wonderland to sample this dish. The Seabass was flavoursome and held its weight against the tamarind sauce. The crispy toast was surprisingly delicate with a taste not too dissimilar to a thin slice of pork crackling. With full bellies, we were glad the dessert menu followed. While I would have loved to worth through the entire menu, I would have lost the challenge. With just four options to select from, you would have thought this would have been an easy choice. Alas, not. The assorted gelato was the safe choice for fussy eaters. As a chocolate lover, 'The World' sounded like my ideal dish, served with peanut butter ganache, Valrhona chocolate mousse and salted caramel ice cream. Marlon advised against the dense dessert, despite its fun presentation (as you can see in this video). 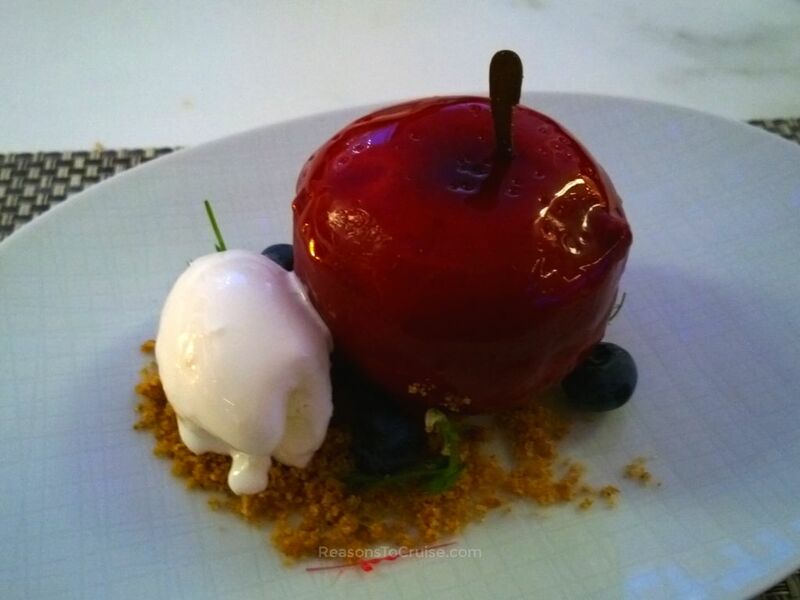 Instead, he recommended the 'Forbidden Apple' served with raspberry Crémeux, brown butter crumble, and yoghurt ice cream. He also raved about the clean flavours of the 'Dream Sundae', where sharp blackcurrant sorbet met luscious Tahitian vanilla gelato and marshmallow. So we ordered one of each to share. The apple stole the award for the best-presented dessert. A mousse-filled jelly-like apple looked far denser than it was. The sundae meanwhile was served inside what looked like a hollowed-out rock. Red sugar-work sat atop of light marshmallow, with the sorbet and ice cream hidden underneath. Both offered clean flavours, and while they looked dense and decadent, they were very light and the perfect way to complete the dining experience. Royal Caribbean's flagship whimsical restaurant has morphed from Quantum-class ships for life aboard the world's biggest cruise ship. In the process, a clean and modern interpretation replaced the cosy, intimate and creative décor that exuded a warm ambience. The lofty and spacious venue lacked magic, sparkle, and whimsy. Thankfully the food stood on its own, and the exuberant and attentive service helped to instil a little mystery into the proceedings. Food lovers should book into Wonderland at least once on a cruise to experience the very best culinary creativity Royal Caribbean has to offer. The expansive menu and the tantalising options will leave you wishing the cruise line offered smaller tasting platters so you can try every single dish. Fussy eaters should not write off booking a table here either. While it is too easy to label Wonderland as somewhere that just serves 'fancy' food, there are familiar dishes on the menu that will appeal to everyone. Take the heavenly beef dish for example which was beautifully tender and flavoursome. This dish alone is worth a try. Trust me; you will not leave disappointed. A meal at Wonderland on Harmony of the Seas costs $45 (&thickapprox; £35) per person - good value for the service and quality of food. With limited seating available this is one restaurant you will need to pre-book. 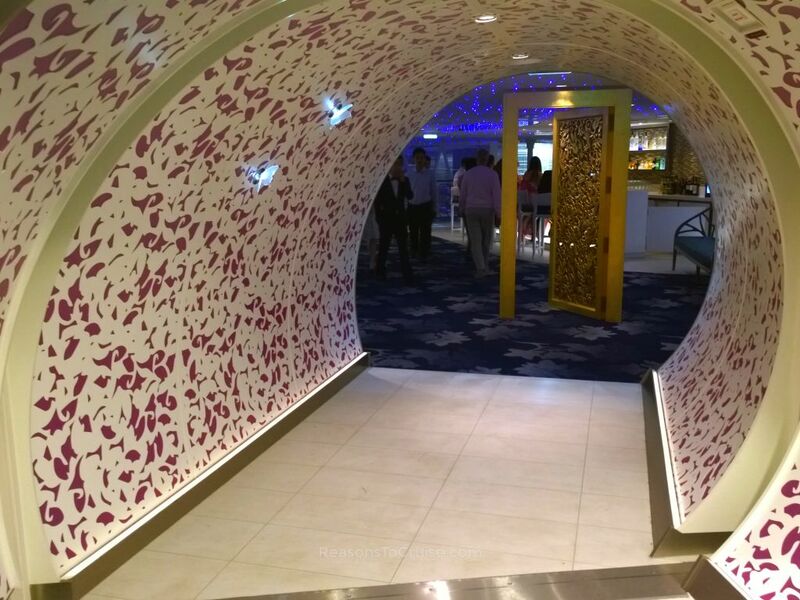 Have you tried Wonderland on a Royal Caribbean ship yet? What did you make of it? Leave a comment below. Disclosure: I paid for this cruise holiday in full, together with transportation to and from the port. Royal Caribbean kindly supplied WiFi access, a meal for two in Wonderland and $100 on-board credit to cover incidentals. The opinions in this article are my own. While the venue is not as ‘magical’ as the restaurants on Quantum-class ships, the food and service both make up for this. The innovative restaurant is a great choice for those who want to push their boundaries with an array of whimsical dishes. Fussy eaters should not rule out booking a table here as there is a selection of ultimate quality dishes available. My top tip would be to try the pork and beef dishes (earth). 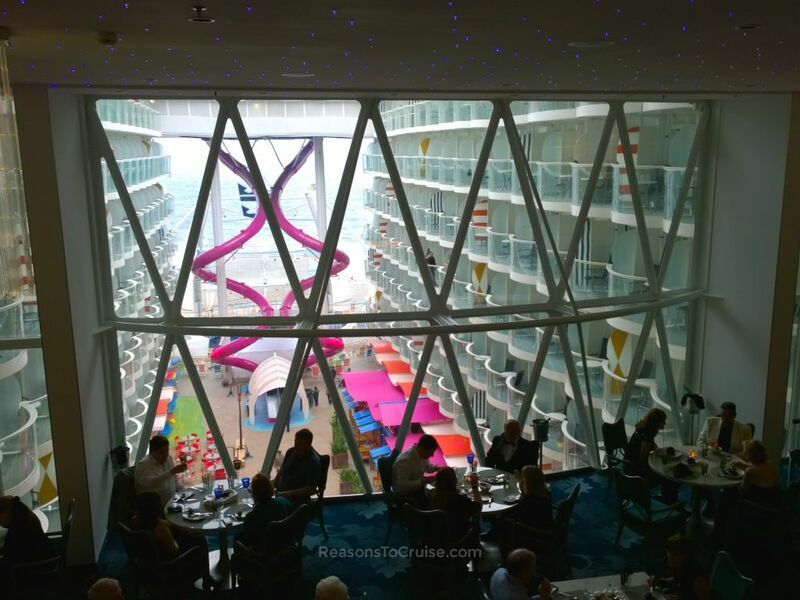 Wow that photo looking out of the restaurant into the atrium of the ship! My friend and I were looking into booking a cruise on this ship, thanks for the info! Will definitely have to check out this restaurant. Certainly beats the food you get on airplanes :). It’s certainly an experience you wouldn’t want to miss on Harmony of the Seas.